Max Stahl was a cameraman whose footage of a massacre changed the history of East Timor. He gave up his life in London and now lives in East Timor where his exploits have made him a national hero. Kirsty Sword was an Australian TV researcher who gave up her career to join the fight for freedom. Making clandestine visits to guerrilla leader Xanana Gusmao she fell in love. They married and in 2002 she became the First Lady of Timor Leste when he became its first President. In 1991 Peter A Gordon made an undercover documentary in a far off island under occupation. It changed the course of a nation - and led to extraordinary changes in the lives of the crew that made it. His researcher fell in love with and married the guerrilla leader who is now Prime Minister and his cameraman filmed a massacre and is a national hero. Has the harsh reality of Independence been worth the sacrifices made by the crew and the thousands who died? With unique access to the principal players BLOODSHOT is the profoundly moving human story of the individuals at the heart of a bloody revolution and of a nation still in the process of healing where justice sometimes has to be sacrificed for reconciliation. I was profoundly affected by this film as it drew me into the reality of living in an occupied country and the fight for independence that came at quite a price. It is rare to be able to revisit the witnesses to such a momentous time and I found it very moving to do so. Seeing the journeys of Xanana, Kirsty and Chris (Max) clearly demonstrated the struggles of shedding the reality of living in an occupied country and the challenges of building an independent country whilst healing the wounds of the past. Your documentary and the story you tell will stay with me for a long time to come. 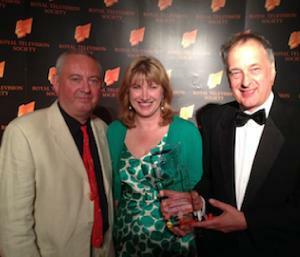 Bloodshot has won 'Best Factual Programme' at the Royal Television Society (Yorkshire Centre) Awards 2014. The event was held at the Royal Armouries in Leeds. Mike Best, Chairman of the RTS Yorkshire Centre was quoted, "This year the quality and quantity of the entries has once again been outstanding. There is no doubt that this year's entrants have certainly put our hard-working judging panels to the test". ‘Bloodshot’ won the FIAT/IFTA (International Federation of Television Archives) Best Archive Preservation Project 2012 at the BFI on the South Bank in London on Saturday 29th September. 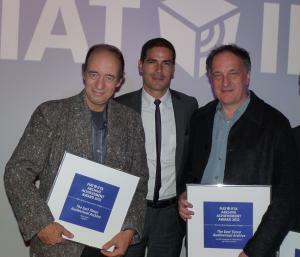 This award relates to the CAMSTL archive which Max Stahl has created in Timor Leste, documented in ‘Bloodshot’. Here are Peter and Max with the award.